Need some last-minute one-of-a-kind gift ideas for your loved ones? The Ontario startup community offers innovative products and services unlike any others. 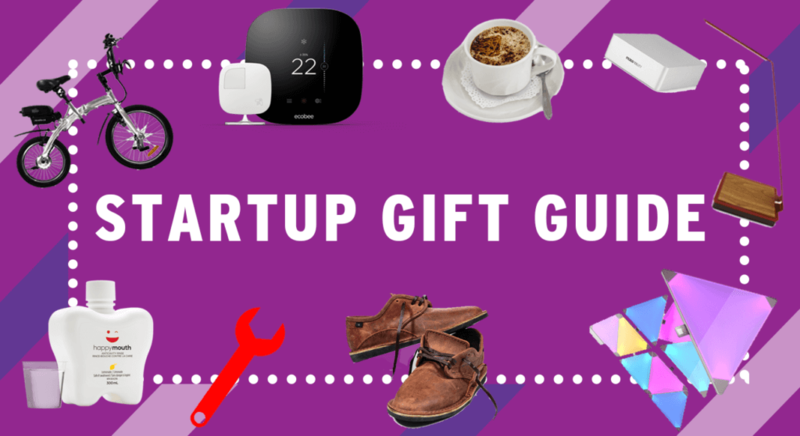 This year, the team at MaRS Market Intelligence has picked some gems from our homegrown companies for our Startup Gift Guide. The following nine items are high-quality, sustainable choices that are sure to impress anyone in your life. 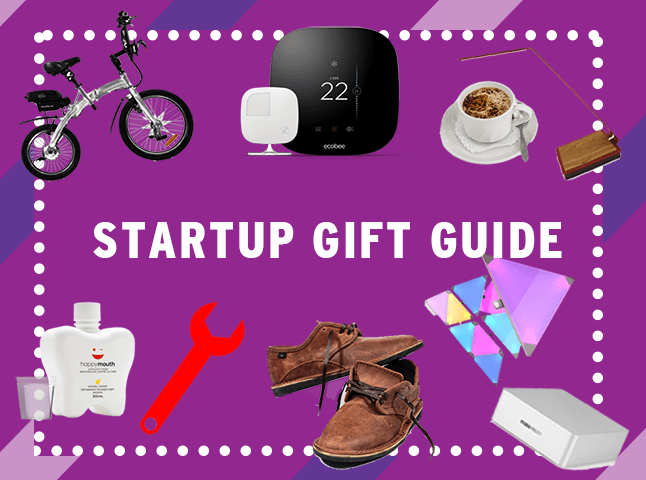 Give a gift from this list! Rev up the holiday season with Revelo’s FLEX e-bike, a sustainable transportation solution that is both convenient and stylish. The FLEX is powered by an impressive 250-watt motor paired with a Samsung lithium battery and travels up to 32 kilometres on just 5 cents worth of electricity. The FLEX is foldable and light enough to carry up to the office, and it’s available in a range of colours to suit any personality. It’s the perfect alternative to beating rush-hour traffic at 28 kilometres per hour. The FLEX comes in a variety of models and the company offers several accessories, including a pannier to store your laptop, a drink holder to carry your morning coffee, a USB powerbank to charge your phone and a cargo trailer for trips to the grocery store. The FLEX can be purchased on the Revelo website and financing options are available. This holiday season give the gift that keeps on giving with a year-long membership to the Secret Sip Coffee Club! Secret Sip Coffee Club works with exclusive premium micro-roasters across Canada to bring its members the ultimate coffee experience. The company evaluates several factors when choosing its roasters—including the coffee’s aroma, body, acidity, finish, complexity and unique tasting notes—to ensure they provide the best coffee available. Each month, members receive a 250-gram package of exclusive, secret and freshly roasted coffee right to their door. It’s the perfect gift for anyone who appreciates incredibly exceptional coffee and the chance to support premium micro-roasters across Canada. The aerelight A1 is a handsome desk lamp that brings the future of low-energy sustainable lighting right to your desk. Featuring a simple, contemporary design with precise angles, the lamp is made out of beautifully handcrafted anodized aluminum and solid American walnut. The organic light emitting diode (OLED) light source limits energy use, while the materials used to make OLEDs have a low environmental impact at the end of the product’s life cycle. OLED is an energy-efficient form of lighting that casts light by electrifying a thin layer of carbon-based organic dyes. The lamp delivers a soft and natural glare-free light that limits eye strain and uses only 80% of the energy of an incandescent bulb. The light is dimmable, enabling custom lighting levels, whether you’re reading before bed or churning out late-night work. It also includes a wireless charger for compatible devices. The lamp is currently available in silver for $399. Ordinary thermostats read the temperature in one room only, but are meant to deliver comfort to all of the rooms in a home. The ecobee3, however, uses room sensors to ensure that each room’s temperature is the right one. The device is able to sense whether anyone is home and in which rooms they are situated, delivering comfort when they’re home and savings when they’re away. Customers save an average of 23% on their heating and cooling costs using the innovative system. Plus, with an easy-to-use app, the temperature can be controlled from anywhere, anytime. The ecobee3 is easy to install and looks great in any home, making it the perfect gift for the environmentally and energy conscious person on your list. A one-sensor system costs $299 and a three-sensor bundle costs $373. They can be purchased on the ecobee website or at retailers including Best Buy and Home Depot. Additional two-remote sensor kits can be purchased for $89. For a limited time, Enbridge customers can enjoy a $100 rebate when they install an ecobee system before December 31, 2016. As the aunt of an adorable and precocious niece and nephew, MakerKids is a lifesaver this holiday season. Named the best kids’ workshop by Toronto Life in 2014, MakerKids is a Toronto-based makerspace dedicated solely to children. At MakerKids, children are encouraged to play and invent to build their creativity and confidence. The kids use computers, tools and materials to actually build their ideas, which encourages them to become creators and inventors, not just consumers. Some of the skills kids can learn include 3D printing, electronics, woodworking, robotics and coding, to name just a few. MakerKids programs run anywhere from one-day workshops to multi-week camps. You can even host birthday parties at their venue. Sure beats a pair of socks and a sweater! I think I’m going to be the favourite aunt this year. Price: $249.99; To enjoy a 15% discount until April 30, 2017, use code THANKSMARS during checkout. Nanoleaf continues its tradition of producing stylish lighting products at the forefront of energy efficiency, but with a major twist this time. Nanoleaf Aurora, the company’s recently released modular smart lighting panels, offer countless possibilities for layout and colour options, enabling users to fully personalize their lighting to match their moods and activities throughout the day. The product’s modularity means that users can change their lighting layouts as often as they like. For those looking for inspiration, Nanoleaf has provided several examples of Aurora design ideas on its website, and the company’s app provides pre-programmed lighting scenes to get you started, such as “snowfall” (calming tones of blue and white) and “romantic” (shades of red and pink—ooh la la!). Aurora’s accompanying app deserves its own mention. Users can control the speed of the lighting scenes (for instance, to add life to a party by cranking the speed up or slowing things down to unwind after a long day). You can also adjust the brightness of the panels to fit your lighting needs. The more adventurous can even create their own scenes and automate them to come on at specific times. Returning the freedom of design back to the users, Aurora is like a high-tech kaleidoscope that is ready to stimulate your senses no matter what mood you’re in. Know anyone who loves shoes? Do they also value social justice and environmental stewardship? Oliberté offers stylish, sustainable and eco-friendly footwear and bags that are designed to make their wearers look and feel good! Oliberté is a sustainable lifestyle brand that supports workers’ rights in sub-Saharan Africa. Based in Addis Ababa, Ethiopia, the company is the world’s first Fair Trade–certified footwear manufacturing factory. This means that the company is meeting or exceeding rigorous standards for empowerment, economic development, social responsibility and environmental stewardship. The company’s premium leather shoes and bags are made from locally sourced leather, as well as from natural rubber sourced from countries including Liberia, South Africa, Kenya and Ethiopia. Aside from being Fair Trade certified, Oliberté is also a certified B Corporation and a participant in One Percent for the Planet, actively promoting environmentally conscious operations. Take a look at Oliberté’s winter collection and choose the perfect gift for the shoe lover in your life this holiday season. If you know someone who wants the absolute best sound after subscribing to a music service (e.g., Apple Music, Spotify), Mass Fidelity might just have the perfect holiday gift. The Core is a wireless speaker that uses acoustic holography technology to produce better-than-stereo sound. The Core Sub is a wireless subwoofer designed to work with the Core to produce rich, low-range audio depth. Relay is both a high-fidelity Bluetooth audio receiver and a digital-to-analog converter (DAC) with premium hardware components (e.g., Burr-Brown PMC5102). In 2014, Mass Fidelity broke records to become the top crowdfunded Canadian company in history, raising over US$1.5 million for its Core Wireless Speaker System on Indiegogo. To counteract the effects of too many sweet holiday treats, give the gift of Happymouth! This all-natural mouthwash prevents cavities without using fluoride, alcohol, cetylpyridinium chloride or triclosan. Approved by Health Canada, the product is powered by Xyncal, which inhibits plaque formation while also combating dry mouth. Best of all, Happymouth is safe to use for everyone age 9 months and up and is also safe to swallow. The mouthwash comes in two flavours: lemonade and strawberry.